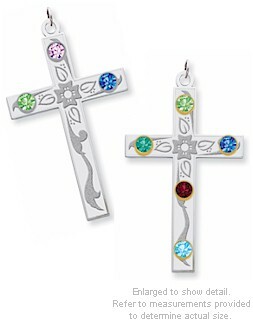 This pretty family cross is crafted in sterling silver and available with 1-5 custom set simulated crystal stones. It measures around 1 1/4" tall not including the jump ring. 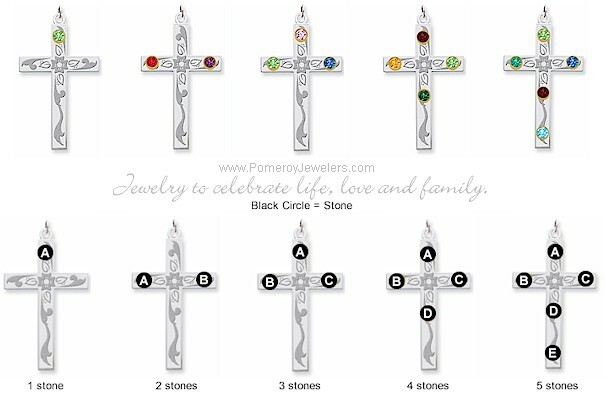 Select from sterling silver or 14k yellow gold bezels- the metal that surrounds the stone. approx. item size provided above to help determine actual size. Many items pictured are samples set with simulated stones. Each piece sold separately unless otherwise indicated. may also ship via FedEx. A brass sample is available for many of the designs we offer. See availability above. If in doubt, order a sample before ordering your custom made keepsake. 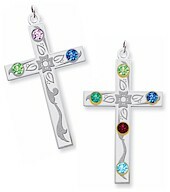 Crystals are set in sterling silver bezels or 14k yellow gold bezels. Outside measurement of bezel is approximately 2.9mm. Select the BEZEL metal quality. Select simulated stones to equal the total number you selected above.